How to choose a wealth manager. A practical frame of reference. 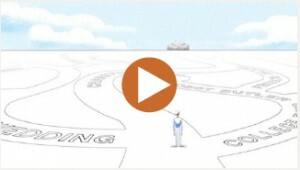 Selecting the right wealth manager can be a major fork in the road. It can also be a little bewildering. Not all firms are created equal. 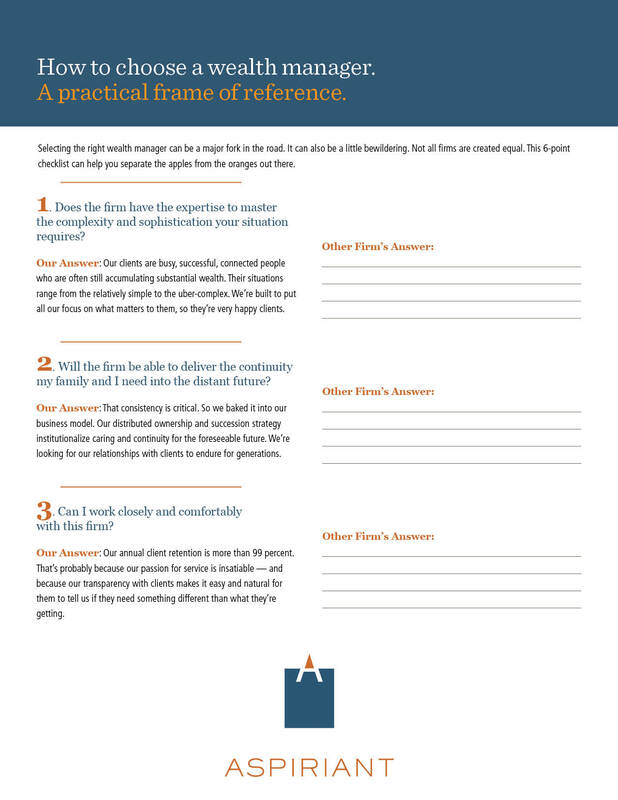 This 6-point checklist can help you separate the apples from the oranges out there. Does the firm have the expertise to master the complexity and sophistication your situation requires? Our Answer: Our clients are busy, successful, connected people who are often still accumulating substantial wealth. Their situations range from the relatively simple to the uber-complex. We’re built to put all our focus on what matters to them, so they’re very happy clients. Will the firm be able to deliver the continuity my family and I need into the distant future? Our Answer: That consistency is critical. So we baked it into our business model. Our distributed ownership and succession strategy institutionalize caring and continuity for the foreseeable future. We’re looking for our relationships with clients to endure for generations. Can I work closely and comfortably with this firm? Our Answer: Our annual client retention is more than 98 percent. That’s probably because our passion for service is insatiable — and because our transparency with clients makes it easy and natural for them to tell us if they need something different than what they’re getting. Can the firm provide access to all the services, products and ideas that I need? Our Answer: We manage over $11 billion in client assets. So we manage your assets, regardless of their size, as if you had a $11 billion family office. We leverage the scale of the assets we manage to solve investment problems and create sophisticated investment solutions for you and your family. We also use the scale of our assets to negotiate fees aggressively on your behalf. Has this firm delivered the personal wealth strategies and investment management they promise? Our Answer: We start with far-ranging conversations with you, followed by thorough analysis. Then we author a written summary of the personal wealth strategies and implementation steps required to realize your goals. We also use our analysis to engineer highly customized portfolios and execute sophisticated investment strategies designed to help you achieve your plan goals. Unlike many firms, we guide you step-by-step through the implementation of your plan. Our clients love this. Like life, the plan is dynamic, so we review it frequently to reflect changes in your life. We’re consistently ranked in the elite tier of personal financial planning excellence. But there’s no complacency at Aspiriant – we’re working harder than ever to raise the bar. What do I pay for? What do I get? Are there conflicts of interest? Our Answer: We’re a fee-only registered investment advisor. That means we don’t generate commissions from products or services we recommend to our clients. You pay us for financial planning services and a percentage of the assets under management for investment services. We have access vehicles and a mutual fund we do not profit from, all created to help our clients. We do everything humanly possible to eliminate conflicts of interest. Click here to download a handy PDF. This animated classic tells the Aspiriant story in under two minutes.